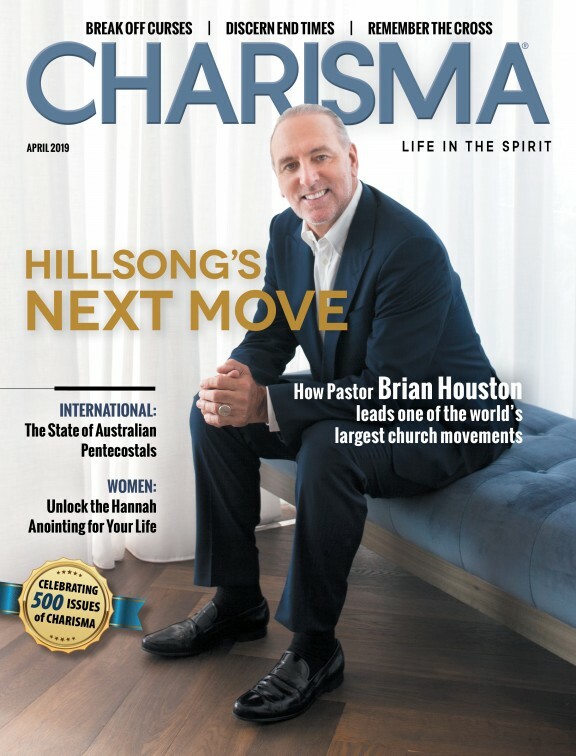 This article was featured in the January 2018 issue of Charisma. 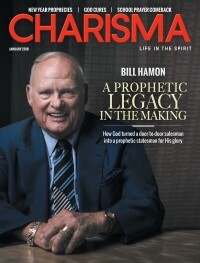 Bishop Bill Hamon used to count the people to whom he had personally prophesied. After laying hands on 50,000, he lost count. That was 20 years ago. Hamon's been an active prophet longer than almost anyone else. In fact, any other prophets or apostles likely owe their ministries to him. Hamon, the pioneer of the modern prophetic-apostolic movement, has devoted most of his life to normalizing the titles "prophet" and "apostle." Before him, those terms were taboo, even in Pentecostal circles. His organization, Christian International (CI), recently celebrated 50 years of service. CI has trained 400,000 people in prophetic ministry. It's got churches on every continent, with new prophetic teams commissioned and sent out every year. Hamon himself has waged spiritual warfare in 30 nations. Look past all the achievements, though, and Hamon will be the first to tell you he's just a man, wielded as a tool by a sovereign God. His friends—inside the ministry and out—gush about his genuineness and integrity. "Bishop," as they lovingly call him, is warm, caring and—in one woman's words—"the real deal." He's a committed family man, still quietly mourning the 2014 death of his wife and steadfast ministry partner. He's so beloved by his three children and their families that they all live on the same street. The first thing most people will notice upon entering Hamon's office, however, is not his wall of family portraits or his substantial bookshelf of theological tomes—many of which he wrote. They may not even notice his ornate collection of swords or a photo of him paying homage to his country-boy roots, decked out in a Stetson and fringed cowboy jacket. These all pale in comparison to the office's centerpiece: a genuine stuffed lion roaring out of the wall, fangs bared and claws extended. "It's the roaming lion of Judah," Hamon says. "I like the warfare. I'm a warfare person. I'm aggressive, and I like the representation of the power and force." A gift brought from Namibia, the lion is one of hundreds that adorn Hamon's home and office. He jokes he has enough lions and swords, so he tells people he's now collecting $100 bills: "Send those my way." Hamon has an exceedingly dry wit, the type that makes listeners realize three seconds later he's told a joke. He deploys that wit as he discusses the days of his youth: "When I was in Bible college, Oral Roberts had just fasted 40 days and nights and launched a healing ministry. William Branham fasted 40 days and nights and had an angel appear to him; he got great words of knowledge and wisdom. T.L. Osborn fasted and got mass evangelism. So every month I was in Bible college, I started a 40-day fast." He pauses a moment. Did you catch it? A smirk grows. He repeats—"every month"—and delivers the punchline with a knee slap: "But the longest I ever made it was 10 days." But beneath that wit is an exceptional man of God. Cindy Jacobs, co-founder of Generals International, has worked with Hamon for years and calls him "an extraordinary pioneer." "Bishop Bill Hamon is one of the foremost leaders in restoring the prophetic and the office of the prophet to the church today," Jacobs says. "Bishop is humble, a man of great integrity and is passionate to help individuals, leaders and heads of state receive guidance through hearing the voice of God. I consider it one of the great honors of my life to call him my friend." To understand Hamon's ministry today requires understanding the world in which he grew up. He says his DNA was birthed in the Latter Rain movement, but early experiences with the prophetic—and a deep feeling that God had called him to greater things—quickly distanced him from his brethren. That's because the 1950s was a decade without prophets. Hamon likens it to "the days of Amos: the word of the Lord was scarce in those days." "Back in those days, hardly anyone believed in prophets," Hamon says. "Pentecostals definitely didn't believe in prophets. They believed in prophesying, but not prophets." In 1953, five ministers visited the Bible college and told Hamon and the other students to fast three days and nights in preparation to receive personal prophecy. The prophetic presbytery system, as implemented by the Latter Rain movement, required multiple ministers to lay hands on and prophesy over one person, kneeling at a chair. None of these ministers could be labeled prophets, but within the consensus of the group, they could offer individual prophetic words. Hamon was six days into one of his doomed "40-day fasts," so he had already fasted when the event came. The presbytery called up one man and then called Hamon. He went and received a word: "Yea, I've kept you under my own purpose." "I read that prophecy over the next 30 years probably a thousand times, but I didn't understand what he meant," Hamon says. Prophecy moved to the backburner for a time, but Hamon never forgot the word—or lost the feeling God had great things for him. In 1954, a 19-year old Hamon became the pastor of a small church in Toppenish, Washington. In 1960, he faced his first life trial, when complications with his wife's third pregnancy and the resulting expenses forced him out of pulpit ministry. He became an insurance salesman, although he said he wouldn't need a policy himself—Christ would return before he died. He labored in that job for three years before God opened doors to return to ministry. He moved to San Antonio, Texas, in 1964 and started teaching at a Bible college. He spent his summers soliciting students to attend and heard the need for a way to provide biblical education without making someone leave home or move across the country. He teamed up with a Christian businessman and founded the Christian International School of Theology in 1967. Extension colleges followed in 1970. But the whole operation was jeopardized when his business partner announced he would close the college in 1973, saying he had lost the vision for the ministry. Hamon instead got all the supplies and materials sent to his home and ran the college out of his garage. He traveled on Greyhound buses across the country, managing extension colleges and keeping CI afloat by sheer willpower. "We zeroed out—no hope, no future, shut the doors, shut the windows, turn the gas off ... ," Hamon says. "But [I just had] to keep holding on, pressing on, standing on the Word of God. ... I finally came to the place where [I said], 'God, if I can just build a platform for my children to launch from, at least I've done something.' ... It was horrible. There was nothing going right." These were not the only trials Hamon would face. In 1981, a fiery car accident caused death and injury in his extended family and then—just weeks later—he was hospitalized after a dune-buggy accident. But like steel in a forge, God had designed these trials to strengthen Hamon for the mantle he'd inherit. "Three different times I had to go three years out of pulpit ministry," Hamon says. "But that was my training, making the man before the ministry. The ministry can be no greater and continue any more than the character and the maturity of the man." He adds: "I'd only prepared a one-story building when I wanted God to use me, and He had to tear that down, dig down deeper and [build] a 10-story building. When He starts doing that, you feel like you're losing ground. You are. He's taking out your dirt and putting in His cement Himself." In 1973, at his lowest point, Hamon received a word from a former student. The young man told him that, in three months, God would release an endless prophetic flow from Hamon. Uncharacteristically, Hamon didn't pay much attention to the word. He couldn't have known, as he embarked on a bus trip to California, that God was about to break ground for a skyscraper on his humble foundation. Stranded in Southern California after hitching a ride, Hamon found himself with "nowhere to go and nothing to do." He knocked uninvited on the door of a former student, David Cook, who was holding a revival in the area. Cook came to the door and said, "Oh, brother Bill, I'm so glad you're here tonight. I told these people three weeks ago that God wanted to speak to every one of them, but I don't prophesy. You're the only one I know who prophesies! ... Would you prophesy over three other people to keep me from looking so bad?" Hamon agreed and went to Cook's church that night. At 9 p.m., Cook turned him loose to talk prophecy. Hamon called up one, then two, then eventually 15 people for prophecy. When he hit 20, he thought he had reached the limit—that's the most people he'd ever seen prophesied to at one time. Afraid of going over his "Holy Ghost quota," he told the rest to line up in a blessing line. He'd get through as many as he could. As people came through, Hamon was struck with flashes of revelation and insight, unlike anything he'd experienced before. "I finally said, 'Well, Lord, I'm not trying to make this happen. What do you want me to do?'" Hamon recalls. "'Do you want me to just lay hands on them and just prophesy to everyone you give me a prophecy for?' God said, 'Yeah, boy. Let 'er rip.'" With the next person Hamon laid hands on, the prophecy flowed. And it kept flowing for the entire line of people—all 85 of them. He finished at 2:30 in the morning. "I've never been able to find in any history or report where anybody's ever done that before," Hamon says. "As far as I know, I'm the first one." He calls that experience his "divine visitation"—and it was a moment that finally made clear Hamon's 1953 prophetic word. "What the Lord told me was, 'I kept you under my own purpose,'" Hamon says. "'I didn't let you be popular in Pentecost. I didn't let you be popular in the Latter Rain. I didn't let you be popular in the Charismatic. I didn't let you become popular in position in the Faith movement. I kept you under my own purpose to pioneer the Prophetic.' That's why they call me the father and the pioneer of the Prophetic around the world." Around that time, Hamon also received a vision from the Lord in which he was caught up to heaven. He saw God cradling a baby in His arms, and God asked him, 'Will you help me raise this baby?' Hamon understood the baby to be the nascent Prophetic movement and the coming company of prophets. And when God asked a question like that, Hamon wasn't about to say no. "When it's born of God, you're responsible for it," he says. "Once you birth the baby, you've got to raise it. That's the reason I wrote all those books and materials and started teaching." Hamon's primary mission at this point was legitimizing the Prophetic and Apostolic movement. He traveled from Pennsylvania to Texas, New York to Ohio, prophesying, laying hands and training people in the prophetic. He estimates that at this time, he prophesied to over 1,000 people a week. He preached a message and—like a tuning fork—people on the same frequency felt the vibe and flocked to him. The hunger was real; people desperate to hear from God would wait till sunup to get a word. The movement grew. And so did the criticism. Hamon's detractors found many reasons to dislike his ministry. Some opposed his rejection of prophetic presbytery in favor of individual prophets. Hamon says others mocked his school with phrases like "Bill Hamon will make you a prophet for $200." Even his sense of humor received pushback. He remembers an old Pentecostal scolding him, "Brother, you should be more serious when you're ministering the Word of the Lord. You were so light and frivolous." "Listen, brother, when you say, 'Thus saith the Lord,' it's so serious you have to laugh or cry," Hamon replied. "I'd rather laugh because the joy of the Lord is my strength." "We had to fight for years to restore the office of the prophet and the apostle," Hamon says. "That's the reason we started our prophetic conferences. I would introduce someone as Prophet So-and-So or Apostle So-and-So. I was determined to make the apostle and prophet as accepted and common and part of the church as the evangelist, pastor and teacher." En route to that legitimization, Hamon wrote The Eternal Church (1981) and Prophets and Personal Prophecy (1987). The books' primary purpose was to train believers in prophetic ministry and activation. Yet equally important, Hamon felt, was establishing the movement's theological bona fides. "The reason I wrote [Prophets and Personal Prophecy] so quickly is I'm a church historian," Hamon says. "I noticed every move of God where they didn't write books immediately showing the scriptural foundation dissipated within a few years. The Latter Rain Movement wrote no books, and it dissipated in 15 years. When Martin Luther started the Protestant Reformation, he wrote pamphlets and books." Prophets and Personal Prophecy, alongside Hamon's earlier book The Eternal Church, may have been the turning point. Consider his encounters with C. Peter Wagner as a case study. According to Hamon, he and Wagner were at first antagonistic. Wagner, not yet Spirit-filled, was derisive of the more "mythical, spooky" aspects of the charismatic world. The first time he preached for Wagner, Hamon mischievously activated his whole congregation in the prophetic and tongues-speaking. Later, when Hamon introduced himself during a panel as a "prophet-theologian," Wagner called it an oxymoron. But Hamon convinced Wagner to read The Eternal Church. Who knows why Wagner complied? Perhaps it was only to prove Hamon wrong. But Wagner later told Hamon it was the most dog-eared, marked-up book in his entire collection—and for the first time, he could theologically accept the prophetic. Wagner even wrote the foreword for future editions of the book. In the same way, many of Hamon's critics eventually accepted his work. At his 2014 celebration of 60 years in ministry, Hamon received letters of praise from a veritable who's who of Christian leaders. Myles Munroe, who died just months later, wrote Hamon, "Your birth was a gift from heaven to earth, and the world is a better place because of you. ... It is my prayer that you [continue] to impact your community with the standards, values, morals and culture of the kingdom of God." Christian International Global Network's executive directors, Jim and Judy Stevens, saw Hamon's mission firsthand: "In the 30-plus years that we have known them, Bishop has had a passion for the nations and a desire to impart the revelation of the Spirit to them." But Kenneth Copeland may have had the strongest praise, comparing Hamon to the apostle Paul and the prophet Charles Green. "God has blessed and used [Hamon] for His glory all these years!" Copeland said. "[Hamon is] a prophet among prophets, standing in abounding grace. That's what I've seen [him] to be in all the 35-plus years I've been privileged to know [him]." Hamon expresses relief that other Christians finally caught his vision but says he had no doubt they eventually would. "I tell people if you want to be prophetic, you have to trade in your sealskin for an alligator hide," Hamon says. "A seal hide is very tender, very smooth and nice. You can't pierce alligator hide, like the Leviathan talked about in the Bible. You've got to be able to [let] the fiery darts just bounce off you. I knew it was born of God, I knew I had the truth, and I knew I was doing what God told me to do. If you have that, you can handle anything." Hamon's prophetic resume is legendary, and he's happy to train up those giftings in others. He confesses privately, though, that many times he wished God would use him in other ways. "I begged God for angels and out-of-body experiences, and He would give me nothing but prophecy ... ," Hamon says. "All my life, 95 percent of my revelation of my future destiny—what I'm called to be and do—has come through personal prophecy from others. He made me dependent upon personal prophecy." Ask Hamon what differentiates him from his peers—Cindy Jacobs, Dutch Sheets or Chuck Pierce, all of whom he praises—and he'll say it's his reproducing anointing. In 1984, an old prophet told Hamon, "You're going to be a reproducer of reproducers who reproduce reproducers." Hamon internalized that word so deeply it's practically in his DNA. Reproduction animates his ministry, and the topic repeatedly leaks into even unrelated discussions. "The reproducing anointing is what's unique about Christianity International," Hamon says. "Wouldn't it have been great if Billy Graham could have produced a thousand Billy Grahams?" But that anointing hasn't always felt like a blessing. In his early days, Hamon was the only prophet for many congregations, a mantle that brought him some fame. He came back to one church two years later, only to see every member—even the pianist—prophesying to one another. He lamented to God, "They don't need me anymore." Hamon heard God reply, "Now you're getting the picture." "Everybody here [at CI] can prophesy," Hamon says. "My grandchildren can prophesy. My great-grandchildren can prophesy. It's a prophetic anointing. If I have people come live in my home, they'll prophesy." Some might credit that to parenting, genetics or even a generational blessing. But Hamon doesn't believe this gifting extends only to his descendants. He good-naturedly boasts that he has four generations naturally but 12 supernaturally. And he believes every Christian has prophetic potential. "I've never found someone I couldn't get to activate in prophetic," Hamon says. "I could take you for three days, and I could have you prophesying and flowin' like a river. You've got it in you; you just have to pull it out." Conversations about the end times are theoretical or abstract for many, but for Hamon, the last days are the reason behind his mission and drive. He believes Christ can't return again until His followers, including Hamon, have fulfilled their mission on earth—a position at odds with conventional Pentecostal theology. He enjoys nothing more than talking for hours about his full eschatological stance and reasoning, but here's the short version: Every 2,000 years in church history, God has changed the spiritual status quo in a major way. The fall of man, the Abrahamic covenant, the resurrection of Christ and some unknown 2030 event—possibly Christ's return—all fall into this pattern. Simultaneously, since the Reformation, the church has gone through nine movements, with intervals between them speeding up. The last few movements—including Latter Rain, Word of Faith and Charismatic—have come just a decade apart. Finally, Christ is being held in the heavens until the time of restoring (Acts 3:20-21). Therefore, Hamon believes the final movement and Third Reformation is upon us: the Army of the Lord movement. This movement is meant to prepare the way, like John the Baptist, for Jesus' second coming. "We're now in the Army of the Lord movement," Hamon says. "The Army of the Lord is God raising up the militant, aggressive people to subdue all things, to make all enemies his footstool and to demonstrate and preach the kingdom of God until every nation becomes a goat or sheep nation." As a young man, Hamon believed Jesus would return before his death. Now 83, he is less confident. The loss of his wife, Evelyn, still hurts. "I knew she wanted to go," he says. "She thought it was her time. And Jesus came to her bedside and held out His hand to her and smiled at her. I tell people, after 59 years of marriage, a man comes by, and my wife ran off with Him." Hamon guffaws at his own joke, but then there's a long pause. The room settles. The quiet sinks in. He blinks through watery eyes as he speaks again. "Every once in awhile, something will happen, and it hits you, and tears well up in your eyes, and you feel it," he says. "But she was in a lot of pain, among other things. ... I told her, 'Honey, you've got to eat. You've got to exercise. You've got to help me. You've got to work with the doctors.' She said, 'I'm ready to go.' [I knew] what she meant was, 'I want to go.' When Jesus appeared to her, that was her invitation to go, and a couple of weeks later, she was gone." But Hamon won't be caught throwing himself a pity party. By all signs, he's at peace with Evelyn's death. But he admits if he stays home too long, it gets depressing, so he stays as active as ever. He says he plans to preach until he's 95—and implies he's on the edge of his seat to see if he lives long enough for Christ's return. He reckons it'll be close. "All things are possible," he says. "If I can preach till I'm 95, that's 12 more years, and that would take me to 2029—I'd be right at [the door of] 2030." Regardless, Hamon is grateful God has let him build a platform for his children—which was his sole prayer when he was at his lowest. And he accomplished his unthinkable mission to normalize the prophetic and apostolic. So what's next for bishop Bill Hamon, prophetic pioneer? He's excited to find out. "Too many ministries feel like they've just been maintaining for years, but now we've got a new thrust," Hamon says. "It's like a new beginning, a new birthing. We've got plans for expanding, [and] we've got the people and the resources enough to take the next thrust." Taylor Berglund is associate editor of Charisma magazine and host of several podcasts on the Charisma Podcast Network.